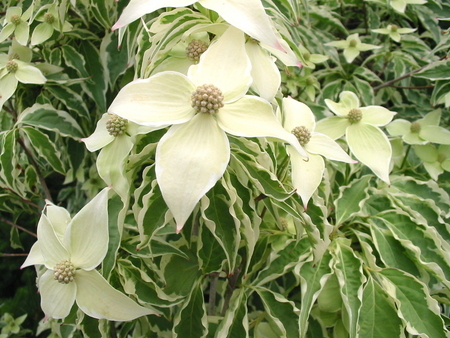 Originally a branch sport, this dogwood is strongly white variegated. It's fine in the sun, but should be used to brighten a shady spot in the landscape. 'Wolf Eyes' is a compact plant and has excellent pink and red fall color. Likely 5-10°F hardier than 'Satomi'. 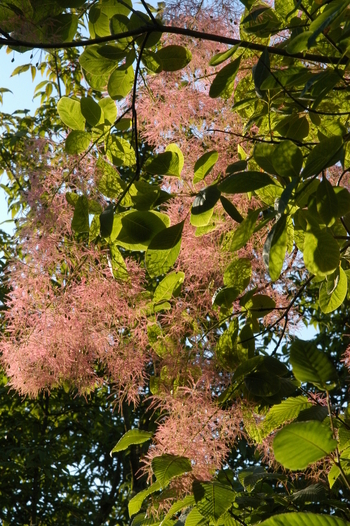 Reddish new growth and pink flowers that emerge pink darkening as they age. It's a pretty plant and elicits because of its attractive hues. 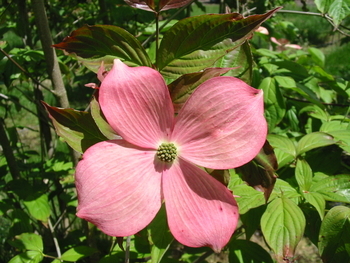 This is the first kousa released from the fabled Rutgers dogwood breeding program. It was selected it for its deep pink to fuchsia colored bracts. They almost glow from a distance. 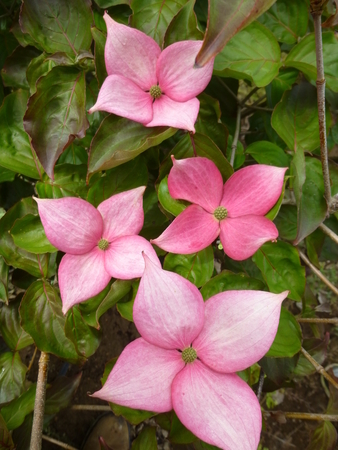 The bracts are pointed and do not overlap, developing an attractive starry shape. 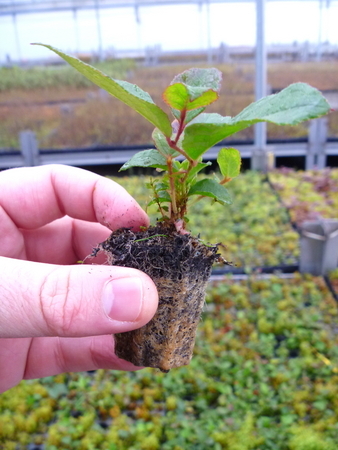 Mostly free of anthracnose leaf disease, and always popular in the nursery trade because seedlings are so inexpensive and easy to grow in a pot. Spectacular when laden with masses of large-bracted flowers. Vase-shaped at maturity, it differs significantly from C. florida by blooming a full month later and has more attractive, strawberry-like fruits. Autumn color is a showy burgundy, and fruits ripen at different stages in colors of green, yellow, orange, and red. Differs from C. kousa, Japanese Dogwood, in its more upright growth, longer internodes, and larger leaves and flowers. These characteristics make it profitable as an ornamental GC promo item, and as a dependable rootstock. 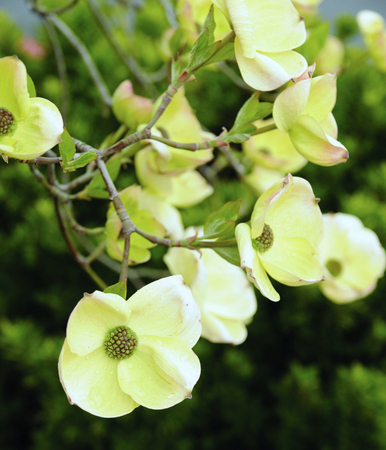 It has all the features you've come to expect from Chinese dogwood: excellent white flowers followed by showy fruit, great fall color of orange red and narrower habit - to only 8 ft. wide in twenty five years. Snow Tower could easily be utilized as a street tree with such a habit! 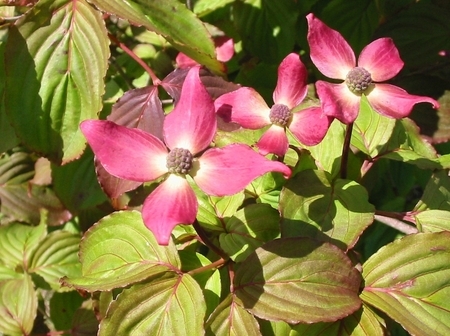 The large, well-formed foliage is cast with a blue haze, very different than any other dogwood. Moderate sized creamy white flowers are starry and the bracts overlap halfway. With clean, dark green leaves through summer and large white flowers in abundance, many people are surprised by Mandarin Jewel's bright orange fruit. This color stands out much better against the foliage as compared to the usual red fruit color, more visible from a distance. Another very fine hybrid from Dr. Orton, this kousa x nuttallii hybrid has stunning pink-red blossoms. One of the top reds on the market. 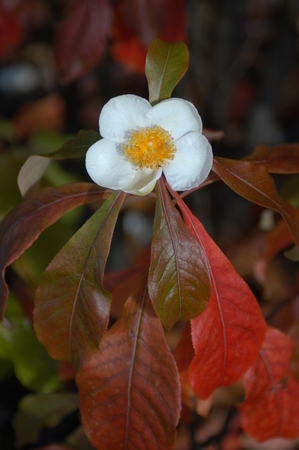 A well branched and freely-flowering tree, it is disease resistant, hardy, and has great red fall color. Muted shades of pink make this a highly attractive plant, even if it's not the deepest pink flower color on the market. 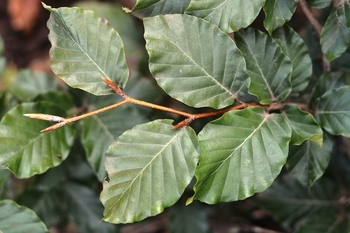 Hybrid vigor. 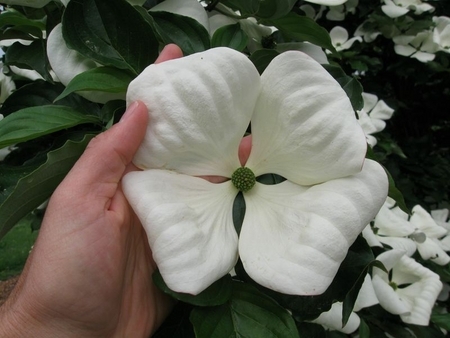 A Rutgers selection with huge white flowers, foliage resistant to the leaf diseases that plague seedling flowering dogwoods. Here in Oregon, our stock plants flower for a month starting in early to mid-May. Its exceptional vigor can result in too-leggy growth, even with routine fertilizer use. Manage nitrogen application conservatively. Of refined, delicate appearance year-long, this woodland shrub from Japan makes a great substitute for witchhazel in smaller gardens. It slowly mounds up, becoming more broad than tall, and is easily maintained. Primrose yellow flowers cover the branches in early spring. Prefers moist, partially shaded borders and open woods, but tolerates a sunny spot fine: it just grows more slowly in full sun. In addition to complete Eastern Filbert Blight resistance, Dorris has smaller tree stature. The kernels have very high quality and great flavor. They will demand a higher price. These desirable traits and those of its pollinizers York and Felix, illuminate the future of the industry. A late season pollinator with very high levels of resistance to EFB, it has low nut yields though they are suitable for in-shell market. Released six years ago, Jefferson has very high EFB resistance and is well suited for in-shell market. It should be planted as a replacement for old EFB susceptible Barcelona orchards. The newest release from OSU, McDonald does get some EFB infection under high pressure, though it has the resistance gene. It is small nut for the kernel market. The tree is smaller than Jefferson. Shawn Mehlenbacher reports, "a high level of quantitative resistance to EFB, similar to ‘ Tonda di Giffoni," thought it isn't totally resistant. It too is 10-15 days earlier than Barcelona and has smaller nuts with a higher yield. A very late season pollinator with total resistance to EFB. It is a good choice for planting with Jefferson. Maturing 10-15 days ahead of Barcelona, Yamhill has complete resistance to EFB. Its nuts, best suited for kernel market, are smaller but harvests exceed Barcelona. 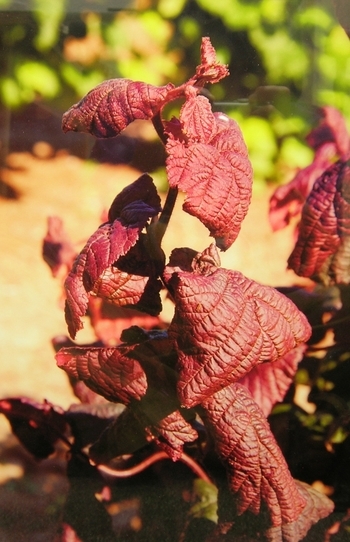 ‘Burgundy Lace’ is a unique hazelnut selection for the ornamental landscape tree market. It is the only European hazelnut (Corylus avellana) cultivar in the nursery trade that combines dissected leaves (the cutleaf trait), red leaf color and resistance to the Oregon strain of eastern filbert blight (EFB). The tree is moderately vigorous and has a desirable upright-spreading growth habit that should be easy to manage in a landscape setting. From Shawn Mehlenbacher's work here at OSU comes a prized, blight-resistant, contorted, red-leaf hazelnut. With moderately contorted growth, it has an arching grace. Its purple color is intense in spring and early summer, and still dark later in the year. These are expensive but worth it; they will attract a lot of attention at garden centers. Uncommon in American gardens, this medium to large tree ought to be used more for its pest-free character, corky bark, and symmetrical cone-shaped outline. Stays remarkably green through the toughest drought. 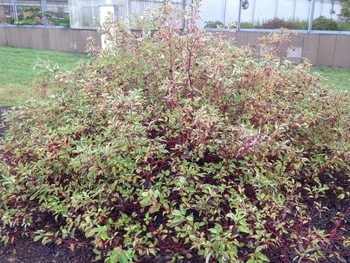 Often used as rootstock for C. avellana 'Contorta' because it has less potential to produce suckers below the graft union as compared to C. avellana. 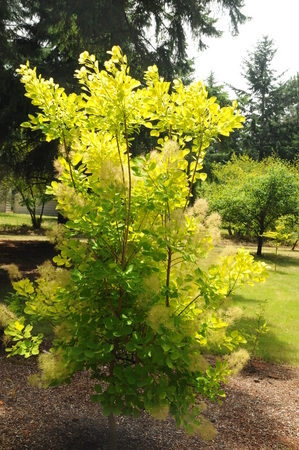 Unusual for its yellow to lime-green summer foliage, and tufts of soft, smoky gray flowers. 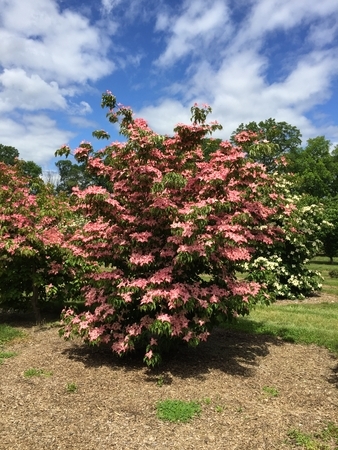 A small but vigorous tree, it grows best in full sun and closes out the summer with fall colors of pink, red, and orange. Deep purple leaves which hold color throughout the summer. Economical alternative to more expensive cultivars, these can be potted up for a popular, easy to grow promo item in the GC. The few greenish plants which emerge in our seedling benches are pulled out early, so you're assured of receiving plants with uniform, dark purple leaves. Stunning autumn color. 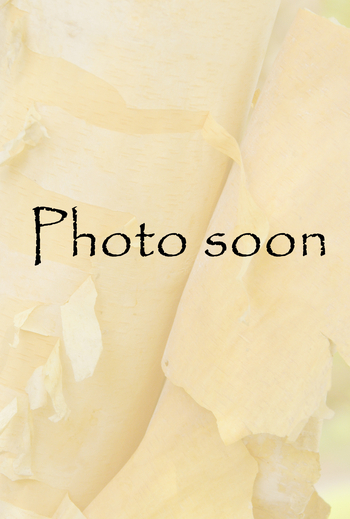 Its flaming fall foliage rivals that of Sugar Maple. Thrives in rocky, dry areas where other trees languish. Larger leaves than C. coggygria and much taller in stature at maturity. The intriguing flowers of this Chinese native tree invite closer inspection. 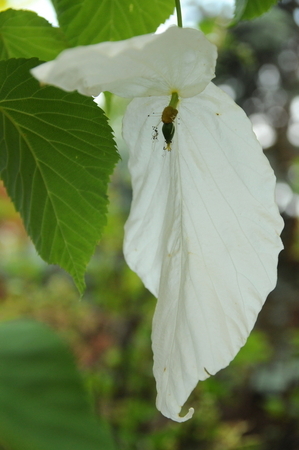 Similar to Flowering Dogwood and Chinese Dogwood, the "petals" are actually large white bracts that overshadow the inconspicuous actual flowers. 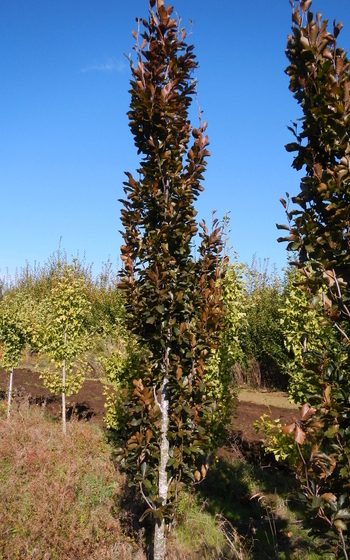 Difficult to propagate and locate in the wholesale trade, Dove Tree is widely adapted and fast-growing to 40 ft. tall. Once established, it makes an strong specimen tree, seldom damaged by ice storms. Medium to large sized fruit of Fuyu type on a smaller tree. Excellent eating. Require 100 hours below 45F. Attractive glossy foliage of deep green clothe this disease free tree. Tasty orange fruit, of the non-astringent variety. 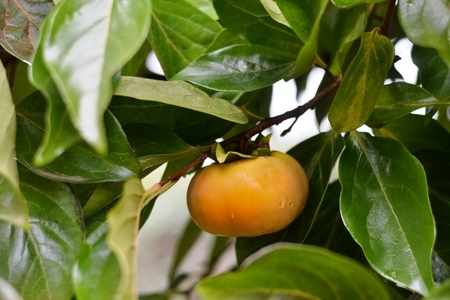 Large and not as flat as Fuyu, it is a non-astringent variety. Native widely distributed in the East. Heat tolerant, tough and having more ornamental character to recommend it than is widely acknowledged. The astringent fruits are most attractive, accented on top with large, persistent calyces. Fruit can be abundant, but isn't usually messy because it persists late into winter, providing a tasty treat for wildlife after the first hard frosts. The deeply furrowed, blocky bark on mature trees is especially handsome when accented by winter snow. 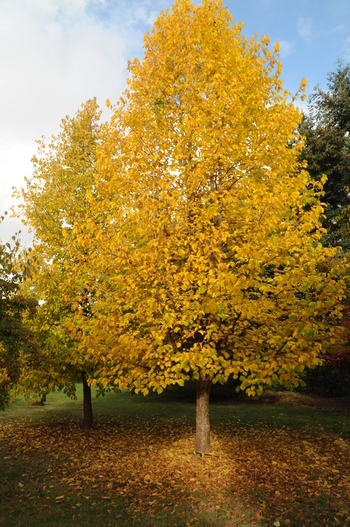 Its unobtrusive size and ease of care make this a tree that deserves more attention by designers and landscape firms, and our propagation numbers reflect big recent up-tick in demand. A choice shrub, rare in the wholesale trade because it is so very compact, no more than 3 feet in twenty years, producing almost no cuttings. Large, snow-white flowers and deep green foliage which turns brilliant red in autumn. 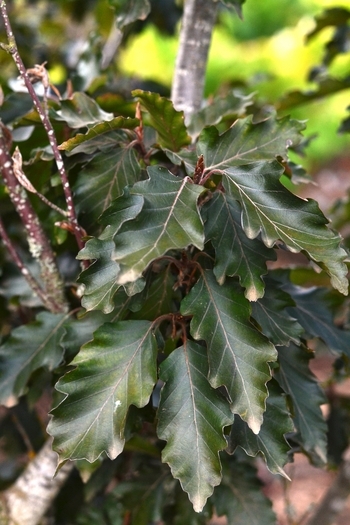 Heat tolerance helps this native tree outperform F. sylvatica in the Southeast, and yet it is also cold hardy. Best for large, open area where it is free to grow, reaching heights of 70-90 ft. The grand patriarch of specimen trees. Generations of horticulturists have selected a rich assortment of beautiful cultivars that are grafted onto rootstocks such as these. Tightly upright without pruning. Its moderate growth rate makes it a useful landscape plant. Bright golden spring foliage fades to green, followed by pleasing bronze fall color. 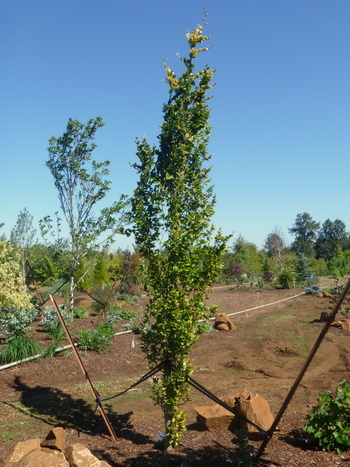 Selected in Scotland as a seedling cross of the green 'Dawyck' Columnar Beech and the golden variegated variety 'Zlatia'. A favorite purple beech that holds a beautiful narrow, upright form. 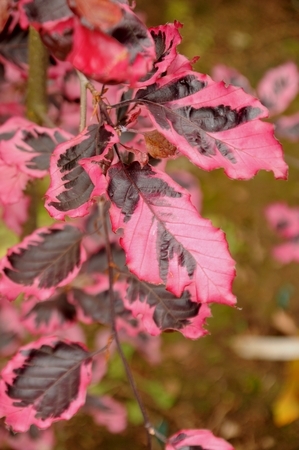 Selected in Scotland as a chance seedling cross of the green 'Dawyck' Columnar Beech and a purple-leaf form, it has become a mainstay in the landscaping trade for its consistent dark purple foliage and appealing upright habit. 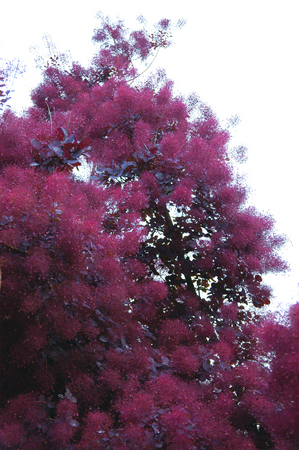 Deep purple, shiny leaves, upright when young, spreading to form a 60 ft. globe at maturity. 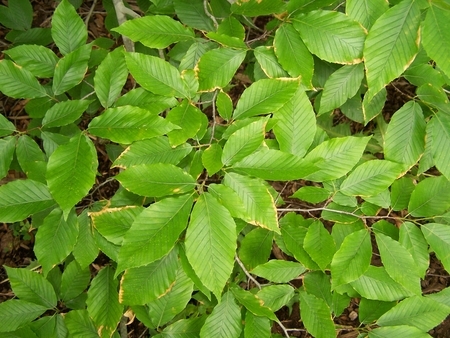 Long in cultivation: cemeteries in many Eastern US cities were often planted with this variety, or other purple beeches that have grown to enormous impressive specimens. Fast-growing in the nursery, they make great field plants to bump later into a #15-20 container. Relatively tight upright form, but not as columnar as the Dawyck selections. Its incised purple leaves with their wavy edges give this popular selection its wide appeal. 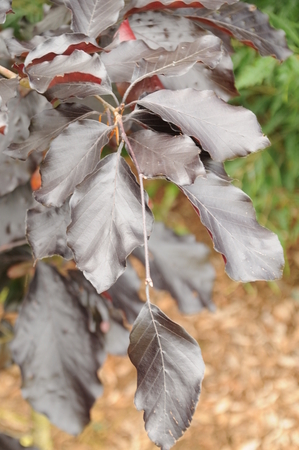 A relatively inexpensive alternative to more expensive grafted varieties, these beauties offer dark purple leaves in the spring draw customer attention in the garden center. 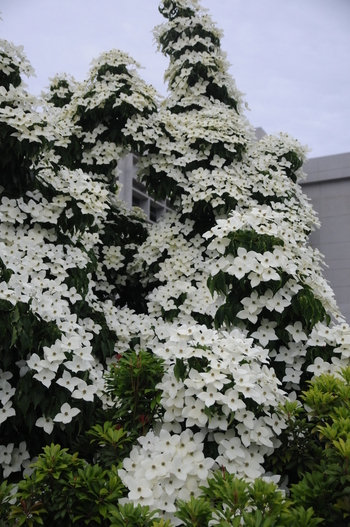 Utilize them as specimens or to make a distinctive hedge. Seed is difficult to procure annually so our supply is hard to predict. So get these when you can, a few years' supply at a time. First on market Forsythia variety to bloom on old wood in addition to new, so this is a huge improvement for a popular landscape plant that needs regular pruning to keep it looking its best. 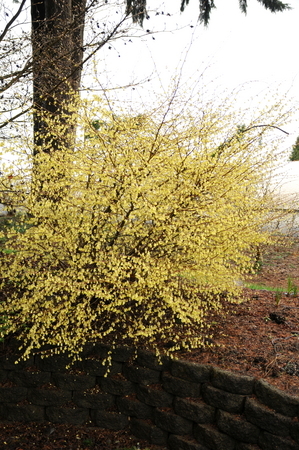 Imagine not having to cut your Forsythia back and lament cutting away the very reasons for growing it in the first place. Long, straight stems are perfect to cut for an indoor vase. A select American native, 'Mt. Airy' merits wider use as compared to its close relatives, the witchhazels, which are much larger in mature stature. 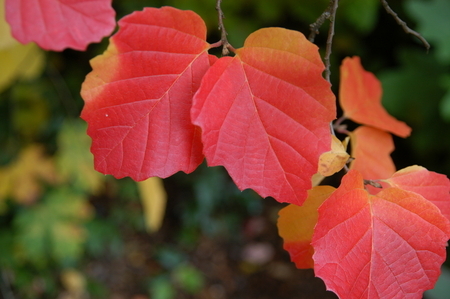 Exhibits excellent hardiness, attractive summer foliage and spectacular autumn color. The white bottlebrush flowers are borne in showy abundance during April/May. Always sought after, this uncommon tree is celebrated because of its legendary origin in horticulture as well as its role as an extraordinary landscape plant. Camellia-like flowers are borne from early autumn until frost. 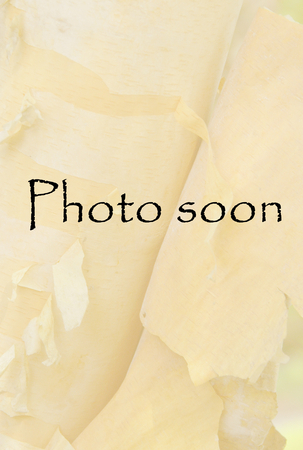 Brilliant, shiny autumn foliage-a plant for your connoisseur clients. 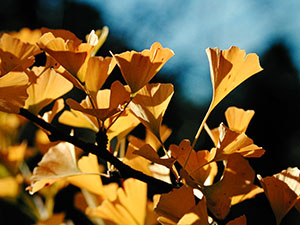 Witness to the birth and extinction of countless species over a period of 150 million years, Ginkgo survives to charm us with its unique fan-shaped leaves and butter-yellow fall color. Consider that even after Hiroshima was devastated by nuclear blast, fire and radiation in 1945, at ground zero it was the lone re-generating tree the following spring. Merits wider use: many new grafted male cultivars are becoming very popular. These are un-sexed seedlings, used almost exclusively for grafting. Among the most popular of the fruitless male selections. Not as strongly upright as the variety 'Fastigiata', Liners require staking early. With age it attains a handsome form and consistent brilliant gold color in autumn. This clone and 'Saratoga' come from the Saratoga Horticultural Foundation. 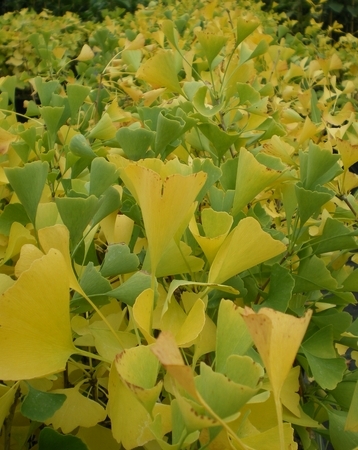 Gold Spire Ginkgo grows slowly but is dense and upright, only ¼ as wide as tall. A male selection, it has golden foliage in autumn as you would expect.